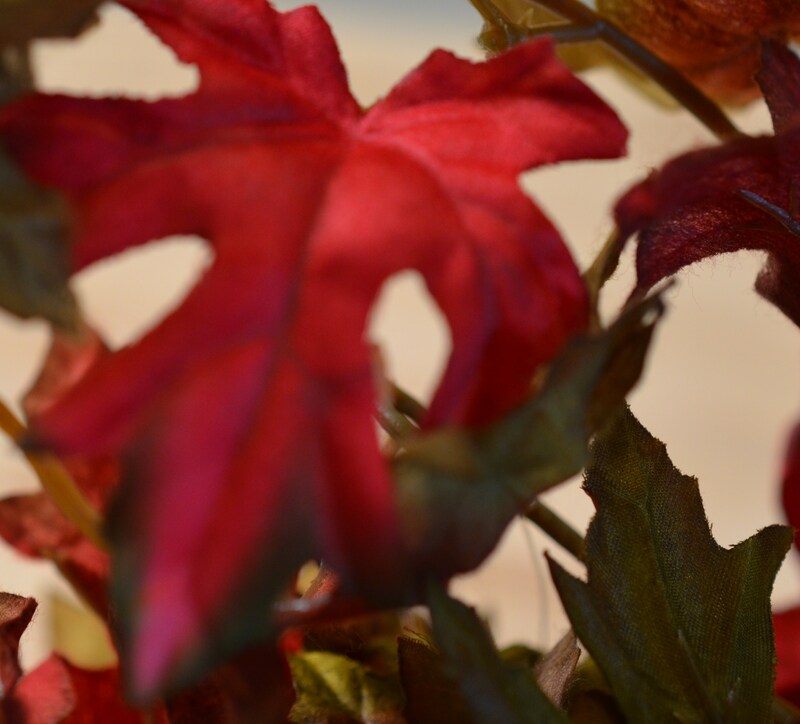 Have you ever seen the pricey leaves or small stems of colorful autumn foliage in interior decorating shops? The beautiful colors preserved for use in fall arrangements, wreaths, and garlands. Save your money and do it yourself. It is actually quite easy. Following is a guideline along with pictures to help you along. 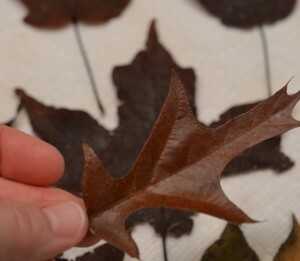 Select leaves that have color and are still flexible. 1. Pick colorful leaves or burnished leaves, your choice. Some people only look for perfect leaves; on the other hand, I like the natural ones with spots, holes, and growths. 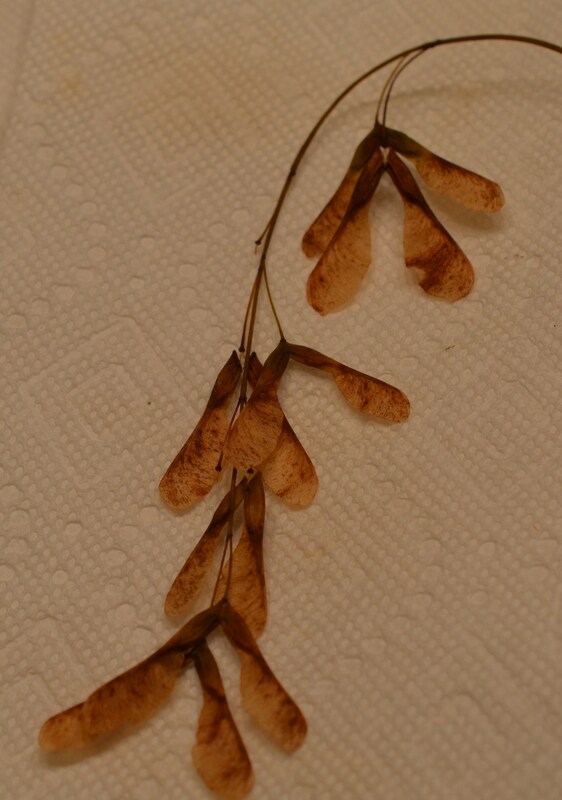 Flattish seed pods like those on elm trees will preserve nicely in this solution too. Even little sprigs of evergreen will work as long as the stem is not too stiff. 2. Find a shallow container with a lid. The leaves have to lay in a single layer. It is alright if a few edges overlap. 3. Using a measuring cup, prepare your solution. It is a 1:2 ration of glycerin to water. For example, 1/2 cup of glycerin and 1 cup of water. 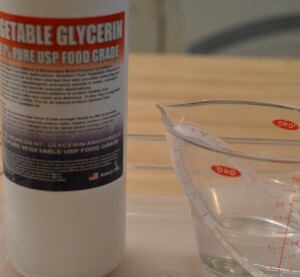 I use warm water so the glycerin easily mixes in. 4. 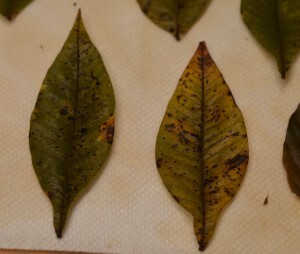 Pour this mixture into the container then arrange the leaves in it. Place in a cool area for 7-10 days. 5. 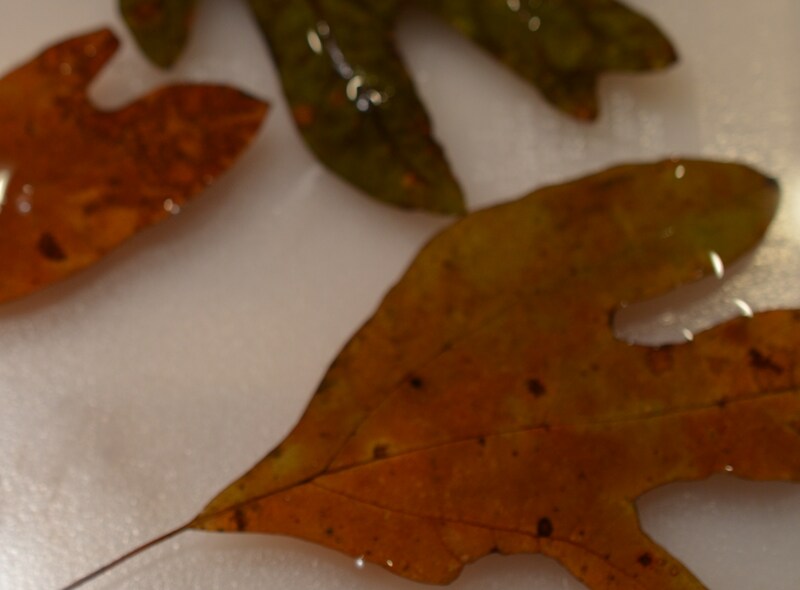 Remove the leaves and place on several thickness of paper toweling to absorb excess moisture. Blot the tops of the leaves as well. 6. The leaves are now ready to make a garland, arrange down the center of a table, or tuck into a fall floral arrangement. You can also use them to accent a cheese tray in lieu of those pricey paper grape leaves. They make charming name cards too. Just write your guest’s name using a metallic marker or a colored marker that will contrast with the color of the leaf. 1. In a 5 gallon bucket, make enough solution using the 1:2 ratio to completely cover at least 3″ of the stem. This would be about 4 cups (1 quart) of glycerin to 8 cups (2 quarts) warm water. 2. Remove any foliage to expose at least 3″ of bare stem. 3. Using a hammer, crush the stem ends to facilitate the uptake of liquid. 4. Arrange the stems in the bucket ensuring the stems are fully in the mixture. 5. Set in a cool area for 7-10 days. 6. Stems are ready when leaves are supple. Remove stems and pat dry. Use in floral arrangements, wreaths, or simply arrange in buckets or vases. 7. Since these are natural opposed to synthetic leaves, store them in a lidded container to prevent any rodents or insects from destroying. Store by wrapping in tissue paper and placing in a lidded plastic container in a cool dark area.